A very common question in my practice is “what’s the proper way to deal with an affair?” How much time should be dedicated to talking about the infidelity? 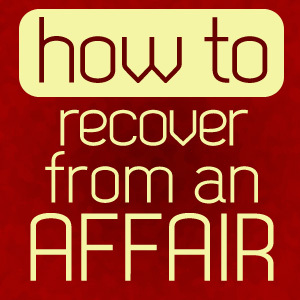 The following video provides one method toward recovering from an affair. Although there’s not one single approach that works for every couple, the most effective strategy is to dedicate certain blocks of time that are appropriate to discuss the infidelity, while leaving other blocks of time as an affair-free talk zone. Offering clearer boundaries gives your marriage the proper structure to heal. The topic for day is recovering from infidelity or affairs. Hi I’m Michele Weiner-Davis, founder of DivorceBusting.com. The most common time when couples come to seek my help is when they’ve been working on this issue for a while after the discovery and they get stuck because the person who’s had the affair is so ready to be done talking about it, rehashing the details, going on and on and on. The other person who is still hurting, still trying to get passed that devastation, really needs information, really needs to discuss their feelings. One person thinks, how can we heal if we keep talking about it. The other person thinks if you aren’t willing to talk about it, you can’t understand how much pain I’m in. Well, here’s the news. You’re both right! And because you’re both right, here’s what you need to do. You need to set aside some predesignated time where you know you will have the opportunity to discuss whatever comes up about the affair: answering questions, sharing information. But conversely, you will set aside time where it’s problem free zone. Where you don’t talk about the affair, you plan dinners together, you go out and do something fun, so that you can rebuild that foundation. All the while knowing if the other person still needs to talk on Tuesdays and Thursday evenings you’ll be able to do that. So if you follow that formula: time to talk vs. time not to talk, you’ll make it through to the other side. Try that. This entry was posted in Video and tagged affair, cheating, divorce, divorce busting, infidelity, love, marriage, Michele Weiner-Davis, relationships, unfaithful. Bookmark the permalink. Michele,nnI don’t care anymore about my husband’s affair. It was short lived and he ended it. But what I don’t understand is that he “came to his senses” and realized no woman can make him happy… he said the grass was NOT greener on the other side…. BUT…… he still does not want ME back. nnHe does not want a divorce yet, and I’m waiting patiently. But your book does not talk about this. We have been separated for 7 months. The affair lasted only 3 months and he ended it about 2 months ago. nnHe says he’s still not in love with me and does not want to do anything to “work it out” between us. He said he IS giving me another chance by the mere fact that he has not divorced me yet.nnI just don’t get it. Can you write about this kind of situation? Is this common or unusual? Michele,nnI don’t care anymore about my husband’s affair. It was short lived and he ended it. But what I don’t understand is that he “came to his senses” and realized no woman can make him happy… he said the grass was NOT greener on the other side…. BUT…… he still does not want ME back. nnHe does not want a divorce yet, and I’m waiting patiently. But your book does not talk about this. We have been separated for 7 months. The affair lasted only 3 months and he ended it about 2 months ago.nnHe says he’s still not in love with me and does not want to do anything to “work it out” between us. He said he IS giving me another chance by the mere fact that he has not divorced me yet.nnI just don’t get it. Can you write about this kind of situation? Is this common or unusual?